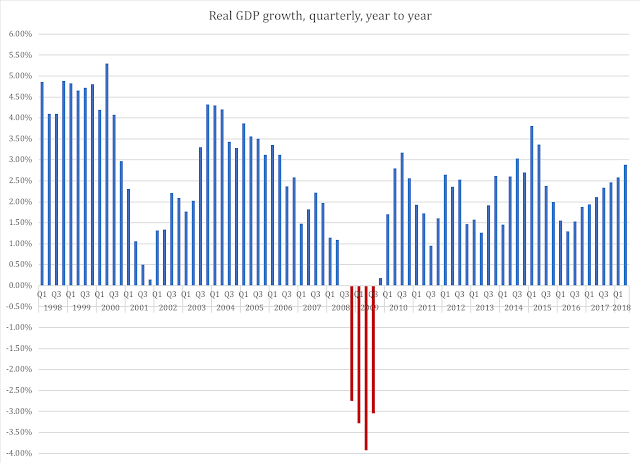 The Bureau of Economic Analysis has published its second estimate for GDP growth in the second quarter. Counting quarter to quarter, the number looks very good at 4.2 percent, but the meaningful number - the number that tells us what the trend looks like - is the year-to-year number. In chained dollars, which are adjusted for inflation, that growth rate is 2.89 percent. It was 2.85 percent in the first estimate. --When growth exceeds three percent per year, the standard of living is growing. In the grey zone between two and three percent, the increase in standard of living depends more on the composition of the economy than on the actual growth rate. In short: the potential for a rise in the standard of living depends on what drives our growth. Ideally, household spending should be at the forefront, as it means the workforce takes home good paychecks and families can increase the quality of their lives. Gross fixed capital formation - business investments - should be right behind consumption, keeping the economy's aggregate capital stock in good shape. As I explained back in July, this is an area where we are having some long-term problems in the U.S. economy: not only have savings declined as share of GDP, but the consumption of fixed capital has increased as share of total business investments. Together, these two trends suggest that businesses are more indebted and operate with a shorter time horizon in their commitment to their operations in America. In terms of growth rates, intellectual property products saw a slight dip into negative growth during the Millennium recession, which cleaned up after the dot-com excesses during the '90s. 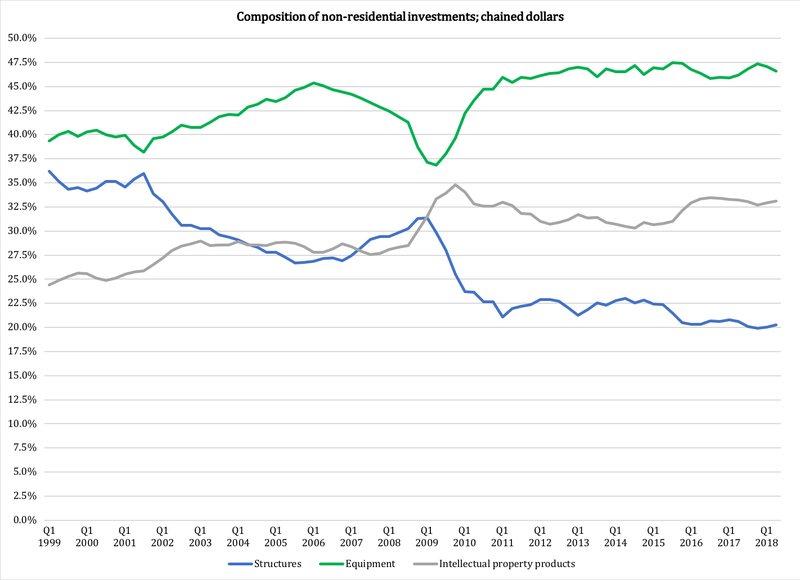 Since then, except for two quarters in early 2009, this category has shown steady growth. 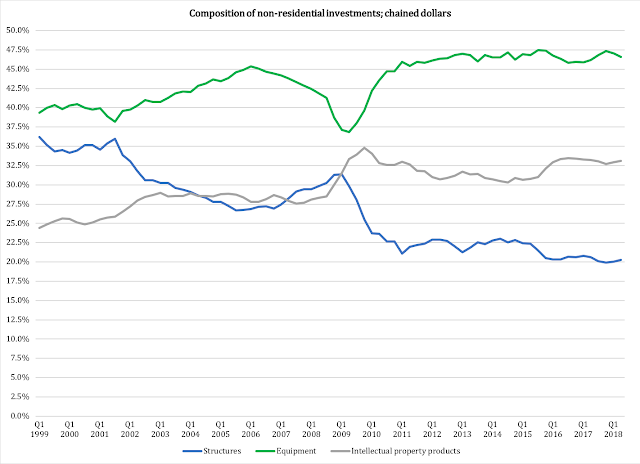 By contrast, equipment investments went negative already in Q2 of 2008 and remained so through all of 2009. Structural investments - the construction of buildings and other facilities for all sorts of business activities - began declining in Q4 of 2008 and remained in the red through the first half of 2011. --Investments in intellectual property products have grown by 5.1 percent, on average. The U.S. capital stock is undergoing a metamorphosis that to some degree explains the shortening of the life span of capital that I discussed in my July article. That noted, this faster write-off of production capital does not explain the lower savings rate, and it is quite possible that what we are witnessing is not the addition of a new kind of capital, but the replacement of some types of industry with another. The fact that our businesses use more software today and less traditional capital such as manufacturing equipment, office furniture, warehouse facilities and other physical infrastructure, does not mean that our businesses are doing better. 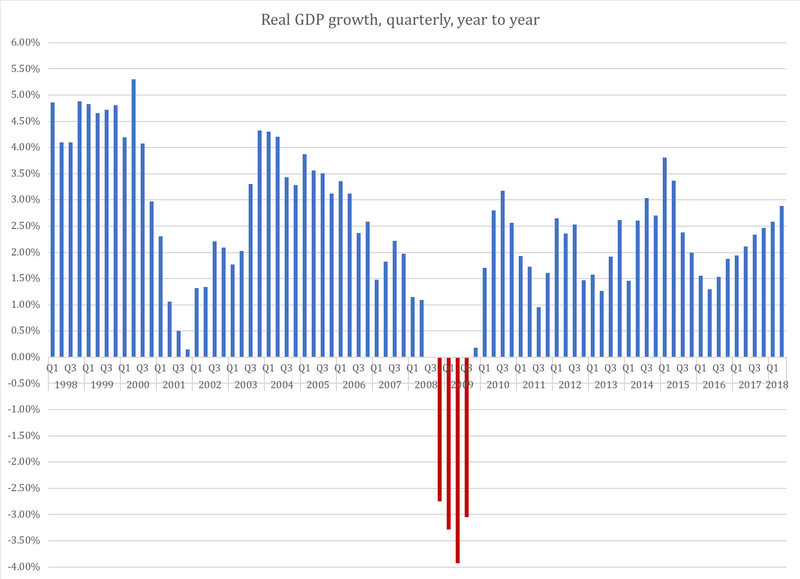 Our economy is still having a hard time reaching healthy growth rates; it is entirely possible - likely, in fact - that the causality between the structure of business investments and the growth of GDP as a whole is runs the other way. In short: there is a good chance that our slower growth rate suits one type of business capital over another. Our businesses could be drifting toward capital with shorter life span because growth is not strong enough to provide a sustainable market for more long-term investments. There is another aspect worth mentioning: the role of corporate welfare. When politicians get into the business of financing corporate investments, they tend to want to favor certain businesses over others. This could explain part of the trend away from traditional production capital toward intellectual property products. It is also possible that this explains part of the decline in savings: if government steps in and funds more business investments, and that type of investment has a shorter life span than traditional structures and equipment, then the need for - and commitment of - private financing declines, at least in relative terms. This is, for now, a hypothetical scenario. However, as soon as time permits I am going to take a closer look at it. For now, let us note that the U.S. economy is in relatively good shape and that business investments are growing reasonably well, but that there are problematic structural trends in gross fixed capital formation that merit a closer look.